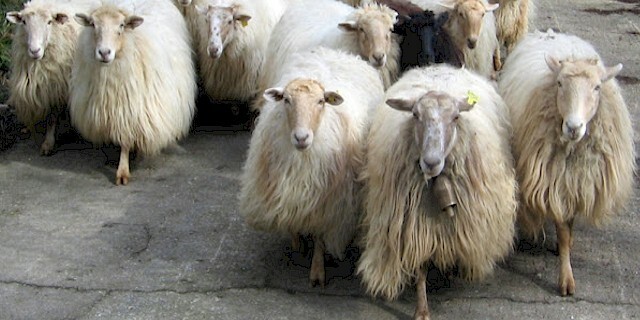 Latxa sheep are a milk sheep breed from the Basque Country of Spain. They are mostly raised within the provinces of Biscay, Gipuzkoa, and Navarre. They are known for excellent quality milk production. Their unpasteurized milk is used for producing Idiazabal and Roncal cheeses. Latxa sheep have been managed traditionally by moving the flock to the mountain pastures in the summer when the ewes have finished lactating, with cheese-making taking place on the farm. Some flocks are moved while still lactating, with the animals being hand-milked on the high pastures. A breeding scheme has been introduced since 1982, and new production methods tested. And for providing earlier lambing and prolonging the breeding season, the artificial insemination is being used. And machine milking is taking the place of hand milking. They are small to medium sized. There are two sub-varieties: one is a dark-faced variety, and another one is the blonde. But both varieties have white colored wool, which is long and coarse.